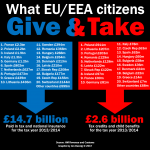 Brexit has two-faced double-standards and nobody knows what or who to believe. On the one hand, the Prime Minister, Theresa May, says that three million EU migrants in the UK are too many; they take our jobs, they cause a burden to our housing and hospitals; they have zero value. 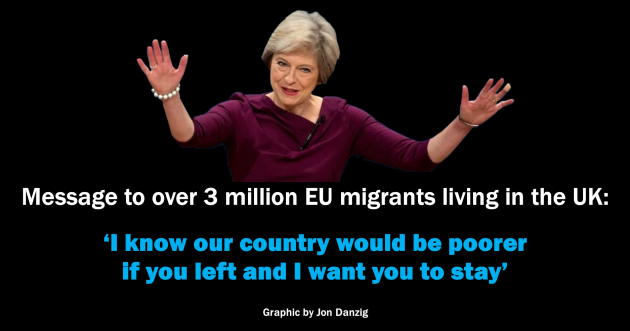 On the other hand, she said in an open letter to all EU migrants that we need you all; we’ll be poorer without you; please don’t go. Yesterday, Home Secretary, Amber Rudd MP, said that the government was “committed” to reducing the numbers of EU migrants, despite Theresa May’s Christmas letter to them all saying the country would be poorer without them. So, what do you believe? That too many EU migrants have been coming to the country, or that we need them all and we want them to stay? No wonder the country is confused. Brexit means forked-tongue nonsense. Mrs May previously said that Britain has too many EU migrants, and we need to bring numbers down to a trickle. But if that had happened, we wouldn’t now have the three million EU migrants that she recently said the country can’t do without. Many people believed Mrs May when she said Britain has too many EU migrants. Many voted for Leave for that very reason. They voted so we would have fewer migrants. 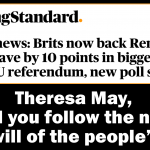 They voted because Mrs May said she’d bring the numbers down. But then just three months ago, Mrs May said we needed all the numbers of EU migrants that are here. There weren’t too many after all. The country will be poorer without them. Does Mrs May and her Brexit government really know what they’re doing? They’re messing with people’s heads; and their hearts, and their lives. 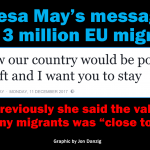 If Mrs May sincerely thinks that all the hard-working, upstanding, law-abiding, tax-paying EU migrants in the UK are needed and wanted, why didn’t she say so before the EU referendum? Instead, at the Tory conference immediately prior to the referendum, she said the current numbers of EU migrants in the UK are of zero value. Yes, she did. High immigration to her then represented the three million EU migrants in the UK. She blamed too many foreign students (how can she possibly call students migrants?) and too many EU migrants. She quoted her party’s manifesto, ‘we must work to control immigration and put Britain first’. She add, “I know our country would be poorer if you left and I want you to stay”. Oh, so now those three million EU migrants are welcome here, when Mrs May previously made clear that she didn’t want them here (at least not in those numbers). But she previously said they were stealing our jobs and putting pressure on our schools, hospitals, homes and wages. 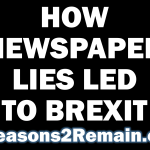 Does Mrs May and her cabinet really understand what is true and untrue? The fact is that Mrs May, her government, and her Brexit are entirely two-faced. Brexit involves double standards. Is that really what Britain voted for on one summer’s day in June 2016? This entry was posted in Current Affairs, Democracy & Citizenship, Economics & Trade, Politics & Public Policy and tagged Amber Rudd, brexit, EU, EU migrants, EU referendum, European Union, migration, Theresa May. Bookmark the permalink.